Have you checked out other book boxes? Maybe even subscribed to a few? 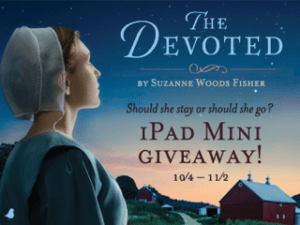 Do you love reading AMISH fiction? Nominating A MOTHER FOR LEAH by Rachel L Miller for an INSPY award! Join me in nominating this heart-warming book for an INSPY award! I enjoyed this wonderful story of hope and healing and family togetherness. Rachel has brought Amish romance back to where I feel it belongs. I reviewed A Mother for Leah by Rachel L Miller when it was released. You can read that POST for my full review, but I’ve posted a snippet of that review below as well as the blurb for the book itself. Rachel L Miller writes with great depth and emotion. Her characters are well-developed and entertaining, and the story will leave you with feelings of love, hope and joy. If you enjoy reading Amish romance stories, you’ll LOVE reading A Mother For Leah. Will Leah Fisher find love because of a buggy accident? Could love soften her heart so that she is able to see her answered prayers in Naomi Yoder or will she drive a wedge between her father and the only woman he has shown interest in since Elisabeth Fisher’s death? Leah Fisher lost her mother ten years ago. She is rapidly approaching womanhood and the lack is becoming more difficult every day. Will she be able to recognize love when it’s right in front of her? Could love be the key to Leah opening her heart, making room for the woman her father intends to marry… or will she stubbornly cling to the memory of her own mother? I hope you’ll join me in nominating this wonderful debut novel. I feel it deserves to win! Don’t miss this Sweet Amish Romance about loss, life and new love! Enter to WIN a Favorite Reads Prize pack! This giveaway is open from August 15th – 30th. One winner will be chosen! Click the image below to enter. 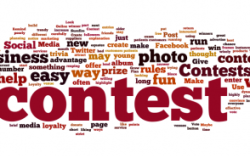 The winners will be announced August 31st on the author’s BLOG! And keep reading below for more about this fantastic book. THE INFO BELOW CONTAINS SPOILERS! 1. The prologue for A Mother for Leah did not exist in the rough draft. It was added later—then removed at the request of an interested agent, then added back in at the request of the agent Rachel signed with. 2. Initially, Leah was a very unlikeable character. Fortunately, with edits (and the addition of a secondary romance), Leah became the charming, sweet girl we see in the final story. 3. The name of Leah’s father’s love interest changed four times before the author settled on Naomi. 4. A Mother for Leah is book 1 in a series. At the moment, there are three books proposed and contracted. 5. There is a companion series proposed, though it has not been finalized at this time. 6. A Mother for Leah takes place in upstate New York and, though Windy Gap is a fictional community that the author created, there are “real” Amish settlements in the area that inspired this novel and several others. 8. The shop in Windy Gap named Sew Sweet is not a misspelling. It is an intentional play on words because the neighboring shops “Sew Sweet” and “SewNice” are owned by quirky sisters who thought it was a clever marketing ploy that customers would enjoy. Today I am reviewing A Mother for Leah by Rachel L Miller. I could easily picture a little girl, standing on her porch, then rushing through the pouring rain to the waiting buggy… I’ve lost both parents and both sisters and I’m the last family member, so I’m sure you’ll understand when I cried buckets at the funeral. The rain falling on the big, black umbrella seemed totally appropriate. Ten years pass and Samuel Fisher has remained single, albeit a difficult thing to do in his Amish community. Even after ten years, Leah is still missing her mother, while caring for her father and brothers. I don’t want to give anything away, so I’ll let you read it and discover what happens when Leah’s father decides it’s time to search for a wife. A Mother For Leah is the first book in the Windy Gap Wishes series… I’m thrilled to help promote this awesome book — and I can’t wait to read the rest of the series! She feels very strongly that God has led her to live a simpler lifestyle – thus her deep kinship with the plain people. She enjoys spending time with her family and doing fun, simple things like swimming, making sun tea, sitting outside watching the sunrise or listening to rain fall on the tin roof. Be sure not to miss any of the great stops on this tour. 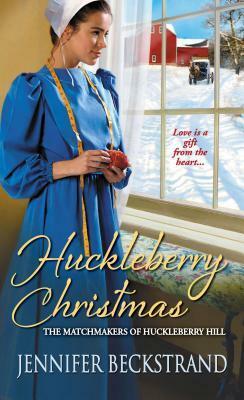 Huckleberry Christmas is the third book in the Matchmakers of Huckleberry Hill series by Jennifer Beckstrand. Now that they’ve happily married off two of their grandchildren, Anna and Felty Helmuth are ready for their next matchmaking challenge. A difficult marriage has left the Helmuths’ widowed great-granddaughter, Beth, finished with wedlock. She’s content to live with them and make a life for herself and her toddler son. But once she turns down handsome Tyler Yoder’s proposal, it seems only fair to encourage him to find a suitable wife. After a failed courtship, Tyler thought the best he could hope for in a wife was mere companionship. But spirited Beth is the one he longs to protect, and hold close. Earning her trust is the hardest thing he’s ever had to do. And soon, both will discover that forgiveness and understanding are gifts that only rekindled faith — along with the happiest of holidays — can bring. I find it close to impossible to choose a favorite from the Matchmakers of Huckleberry Hill series! Huckleberry Hill was my favorite story… until Huckleberry Summer came out and I read it… then it was my favorite — I loved it when Lily called Aden’s dog Piecrust! Now I have a new favorite… Huckleberry Christmas! Oh my… it is perfect! I don’t have a clue how Jennifer’s books just keep getting better and better, but that’s my honest opinion! They just keep getting better! Not only does Jennifer continue to amaze us with her wonderful stories with Anna and Felty, but each book adds new characters to the ones we previously met, and the surprises, along with twists and turns, keep us glued to each book (or our tablets)! Take a woman who has been submissive for too many years, with too many others taking advantage of her, of treating her more unkindly than they probably would their horses or other animals. Yes! It was past time for her to finally begin to stand up for herself; only did she have to just when the perfect man appeared and wanted to help! OK, no more hints or clues… but let me assure you that you’ll love this story; it’s absolutely wonderful! 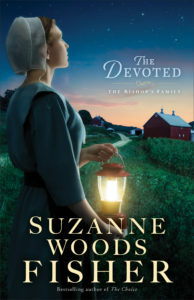 Today I am reviewing The Devoted… the third book in The Bishop’s Family series by Suzanne Woods Fisher. Bestselling author Suzanne Woods Fisher invites you back to Stoney Ridge for a story of dreams deferred—and the promise of hopes fulfilled—complete with Fisher’s signature twists that never fail to leave readers delighted. In this long-awaited novel, Suzanne takes us back to Stoney Ridge to follow along Ruthie Stoltzfus’ journey. It is not an easy one—and not one, but two young men stand in her path to leaving the plain life. There is much more to Ruthie than what you see on the surface. She has secrets. She has dreams. She has plans. What is keeping her in Stoney Ridge? Could it be her family . . . or the new young man in town . . . or the boy next door — the ex-boyfriend who is determined to win her back? I’m not certain even Ruthie knows, but something is holding her back. Will she choose faith, family and love — or will she set off on her own to explore a world outside of Stoney Ridge? You’ll have to read it to find out. In fact, I recommend you read the whole series. You’ll be blessed by it. 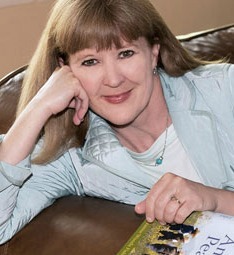 Suzanne Woods Fisher is an award-winning, bestselling author whose most recent novels include Anna’s Crossing and The Inn at Eagle Hill series, as well as nonfiction books about the Amish, including Amish Peace and The Heart of the Amish. She lives in California. Learn more at http://www.suzannewoodsfisher.com and follow Suzanne on Twitter @suzannewfisher. and 1 (one) GRAND PRIZE giveaway! ONE WINNER will be selected each Saturday during the month… these 3 WINNERS will each receive one of Ruth’s inspiring books — autographed — and sent to you directly from the author! The GRAND PRIZE WINNER will be selected (and announced) on the last Saturday of this month… February 28th… and will receive three of Ruth’s books! 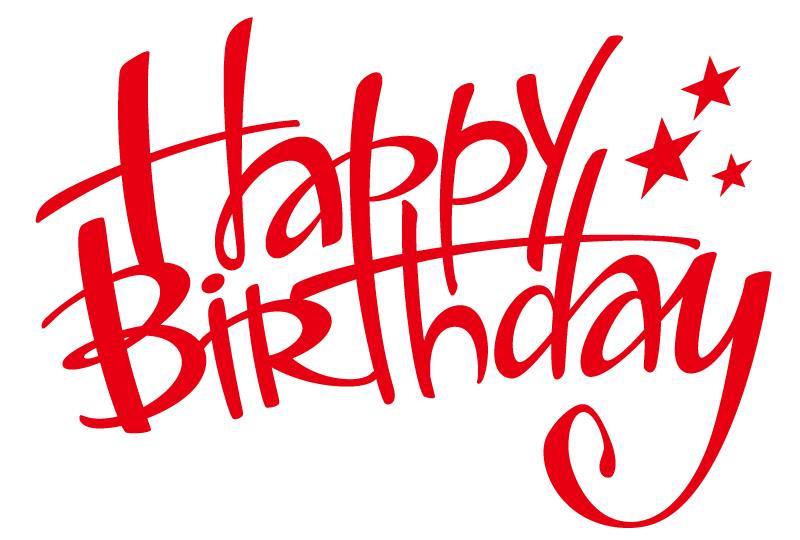 Don’t miss this opportunity to win a book by RUTH REID – Tweet this! Now go enter! And tell all your friends about this contest! Want to WIN an inspiring romance novel by Ruth Reid? – Tweet this! Please remember that giveaways are limited to US residents only. 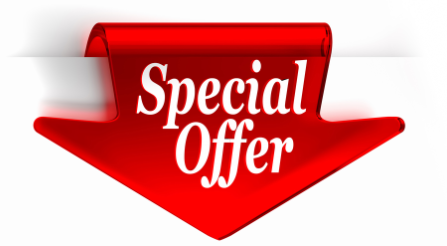 Visit my giveaway rules page for a complete explanation of the terms and conditions of this giveaway.